How cute is this Poshlocket bow cuff! I can't stop wearing it! And these bow earrings to match! Today I am teaming up with Poshlocket to bring you a great giveaway! Poshlocket is an online fashion jewelry boutique. The price and quality for there pieces is amazing! Poshlocket will be giving ONE lucky Spoonful of Style reader a $35 gift card!!! Giveaway runs till friday May 3rd. Winner will be announced on Monday May 6th. love love LOVE your blog! I follow you on GFC, Followed Poshlocket on pinterest and pinned the Macy flower studs! Email me at Jadealisonscott@gmail dot com to receive your gift card! Thank you to everyone who entered! Stay tuned for another great giveaway coming this week! I love your lace skirt and layered top colours!! Loveeeee your bag, and you're totally inspiring me to do the whole double-gingham thing!! Maybe tomorrow. ;) You're adorable! LOVE the mix of gingham!! Love your blog and love a giveaway! Entered to win plus the extra entry. Thanks for introducing me to Poshlocket, already pinned several necklaces and bracelets that are amazing pieces! Fav pins are the Blair Link Pave bracelet and the Arden Cross Necklace! 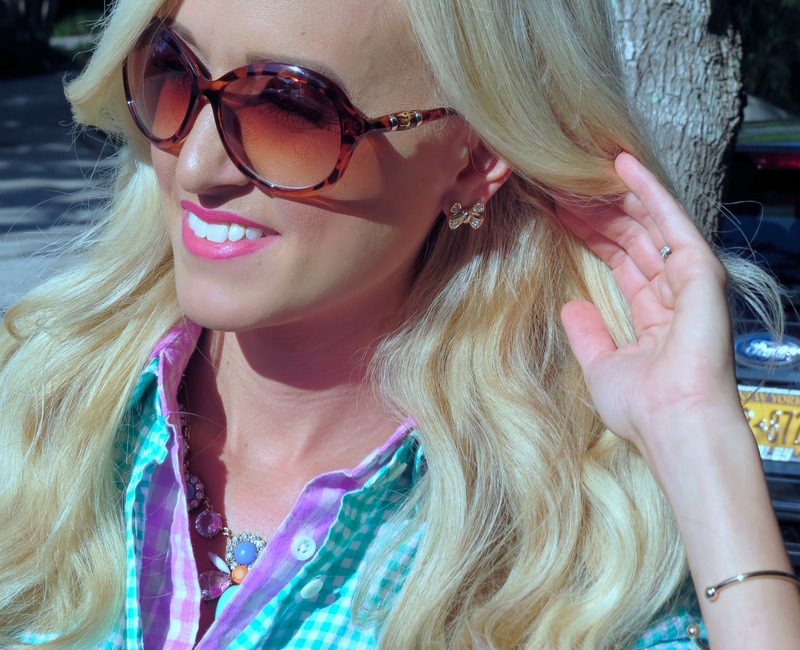 I just love the double dose of gingham Jade and your accessories are perfect, as always. I followed all of the requirements and pinned the Noelle Chunky Chain Necklace! It would be so perfect with all of the pretty pastels I plan to wear this Spring. I followed Posh Locket on Pinterest. Hi! I did all of the above + the extra entry. I adore the Jacey Spike Rock Bangle! It's amazing!! I pinned the Colleen Arrow Cuff, it's so cute! I pinned the Blair Link Pave Bracelet. It is my favorite! I pinned the Colleen Arrow Cuff in silver- my fave! I pinned the Grace Bow Station necklace in white. Love this necklace! I pinned the grace necklace and followed posh locket on Pinterest. Love that layered look!!! I followed Poshlocket on Pinterest AND I pinned the poppy color link necklace in turquoise!! Las camisas son de unos colores preciosos!!!! pero la falda ME ENCANTA!!!!!!!!!!! Love this outfit! I followed all requirements and also follow Poshlocket on Pinterest :) here is a link to my pin: http://pinterest.com/pin/33214115974239851/. Thanks for the giveaway! HI!! you are adorable!! love following you here and on Instagram. I entered the contest. Did all of the above and re-pinned the chunky gold necklace from their pinterest. I am also following them now. Thank you for the adorable giveaway!! Love.. Love.. Love Your blog!! I followed all the requirements and I'm following Poshlocket on Pinterest!! I pinned the Mandy Triple Bpw Cuff!! Thank You for the giveaway !! I pineed the Lois Pave Ball Cable Bangle!! I also follow Poshlocket on PInterest! I follow Poshlocket on pinterest! I pinned Jestina Orbit Bangle! I follow a Spoonful of Style on GFC as nadya55k! Love your blog and your style! I pinned the starfish bangle...love it in mint! There are so many beautiful pieces on the site though! Would love to win! I also am following them on Pinterest. Thanks! I pinned the gold arrow bracelet! Follow you on GFC & followed poshlocket on Pinterest! Great giveaway! I love Poshlocket! I pinned the Blair Link Pave Necklace on Pinterest! I follow you and Poshlocket on Pinterest! I just found your blog & love your style!! I saw this outfit & knew I had to have something similar.